National Missing Pet Rescue Network » Cancel the cruel rodeo event for 2016 and all future years. Just last year we petitioned for the fair to stop having events that promote animal abuse/cruelty and cancel their abusive pig wrestling event. The pig wrestling event has stayed cancelled for this year, as far as we know, However, they are having a just as abusive Rodeo event. According to YouTube videos posted by the fair itself the event shows contestants picking up lassoed calves, slamming them down on the ground, setting on them, to rope them. In the video I’m posting on here you see the man lasso the calf, jerks the rope back hard yanking the calf around, as he’s going to pick it up to slam it down with the rope still tied to the horse, who is still pulling on it which is pulling on the calf’s neck. This is clear abuse, animal cruelty, ect. If a normal person were caught doing such the county would be arresting them and charging them with animal cruelty, however, as with the pig wrestling event, it brings the county fair money so it’s condoned animal abuse to generate money. This is worse than a regular citizen committing this act because the county is ok’ing it for financial gain. As with the pig wrestling event it’s also teaching adults, and children that abusing animals is ok, well at least as long as they are using it for financial gain. A city already full of violence, and they continue to promote just that, violence. When will they stop? 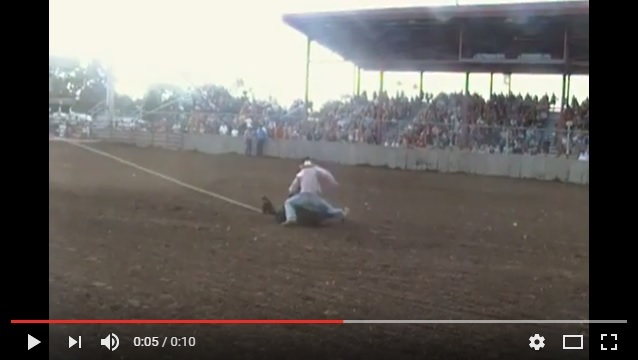 Rodeos mean constant trauma for the animals forced to participate. They suffer broken ribs, backs, and legs, torn tails, punctured lungs, internal organ damage, ripped tendons, torn ligaments, snapped necks, and suffer agonizing deaths. Even when animals aren’t injured (and they often are), they still suffer from fear and pain involved in the events, and the stress of travel in crowded, ill-ventilated trucks. They are used time and again before their bruised and battered bodies are shipped to the slaughterhouse, or worse, made to relive the abuse over and over, and over again for the entertainment, and financial gain of those choosing to abuse them. Manipulating an animal to buck or be lassoed into submission in front of a crowd of people is both cruel and extremely stressful to the animal. While these animals may or may not be cared for in a proper manner out of the spotlight, in front of a crowd they are in obvious distress, and that is animal abuse, cruelty to an animal, and should not be allowed to go on, especially at a county fair where children are. Abusing calves in the Rodeo as entertainment for humans is inhumane & cruelty to animals! The calves have no choice of whether they want to be lassoed or not, they cannot give consent. It’s a proven fact that violent criminals first start out harming animals when young, and move onto humans. Promoting rodeos to children is teaching them that abuse is ok, even for their entertainment. Children exposed to cruel events such as this are more likely to grow up and further harm more animals and people. The city should instead be setting a positive example for its youth, and teaching them that harming animals, especially for entertainment, is wrong and inhumane. In a city with a very high crime rate, which includes child abuse and domestic violence, these events should be banned not promoted. The way a city treats all of its animals and children shows the character of said city. Cruelty to animals is being fought all around the world yet many places are still stuck in the past because it’s generates money, and because it may have been seen as acceptable years ago. Indiana is promoting itself as “inclusive” but when are they going to begin protecting animals, first by stopping condoned abuse done by the city or county themselves? There are many non-violent forms of entertainment for humans that could be held instead, such as, human mud wrestling (two humans), mud football, bicycle races, archery contest (there are numerous Arrow fans in Muncie, I’ve been told many would enter). We the signed ask that this and all events abusive to animals be stopped here on out and replaced with events that do not promote violence to animals, or violence at all.